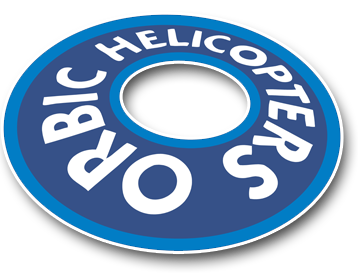 Orbic Helicopters offers the highest quality personalized flight instruction in our fleet of Robinson Helicopters. 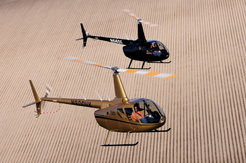 Our fleet includes the R22 and R44 for primary flight training and our IFR R44 Raven II and new turbine R66 Helicopter for advanced instruction and turbine transition training. We offer advanced flight training in all helicopters, including full down auto-rotations. 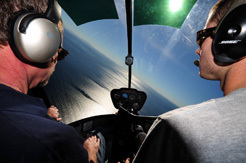 Our high time Certified Flight Instructors will assist you in obtaining your dream! If you are interested in pursuing your dream of being a helicopter pilot, call us today at 805-389-1070, or stop by our hangar located at 777 Aviation Drive, Camarillo, California, 93010. The Federal Aviation Administration requires a minimum of 40 hours flight time, to include 10 hours solo flight time for your private pilot helicopter rating.. Other requirements include passing a written knowledge test, obtaining a FAA Third Class Airman Medical Certificate, passing the FAA oral knowledge test, and passing the FAA practical test (check ride). Located in one of the most beautiful parts of our country, Orbic Helicopters offers many tour options to experience the natural wonders of our California coastline! 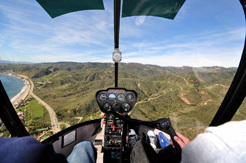 Fly with Orbic in one of our comfortable, high visibility helicopters, and get a bird’s eye view of our world famous Malibu beaches and picturesque Ojai Valley, with the scenic Topa Topa Mountains as your background! We offer several scenic tour options, with each tour sure to please even the most discriminating passenger! Choose between the romantic sunset tour (with incredible views to the Channel Islands Nation Park), coastal beach tour, Ojai Valley tour or have us customize a personalized tour just for you! There’s nothing quite like a Helicopter tour! Experience one for yourself or loved one today! We are available for all aerial photography, from commercial to private party applications. With our experienced helicopter pilots available for your photography needs, we can assure you the perfect shot! Call us today for more information on helicopter aerial photography and filming!